Our retail visual display hanging grippers and trapeze bars are distinguished by their ease of use, outstanding gripping power, and the many hanging options. 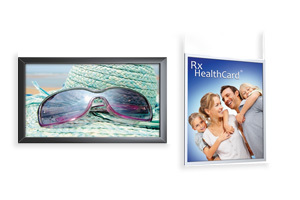 All our hanging graphic hardware is made of strong but lightweight aluminum alloy. The satin matte finishes are complementary to almost any environment. 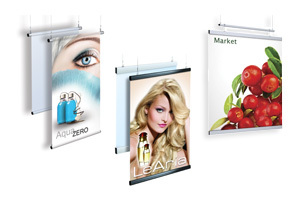 Other hanging business office displays or ceiling hung display signs include wall poster frames, snap graphic grippers, snapgraphic slimline, easygraphic grippers, trapeze hanging bars, halos, halo rails, hanging banner kits, perfex hanging frames, hanging monster frames, circle moons displays, visual merchandising clamps, perfex sky frames, trapeze j hook system, trapeze bars wall mount, hanging hardware and horizon hanging structures.